An international airport serving the Darjeeling district in the state of West Bengal, the Bagdogra Airport, also known as the Civil Aerodrome Bagdogra is located 11 km west of the city of Siliguri. Operated as a civil enclave at AFS Bagdogra, the airport is a gateway to Siliguri, Jalpaiguri, Darjeeling, Kurseong, Kalimpong and other North Bengal region. The Bagdogra Airport is among the few airports in India with zero sales tax on aviation turbine fuel. Bus: 18 km from Siliguri Bus Stand. Rail: 17 km from Siliguri Railway Station. A small town in the Darjeeling district of West Bengal, Bagdogra is surrounded by lush tea gardens. 11 km from the town of Siliguri, Bagdogra serves as a gateway to the Northeast Indian states. 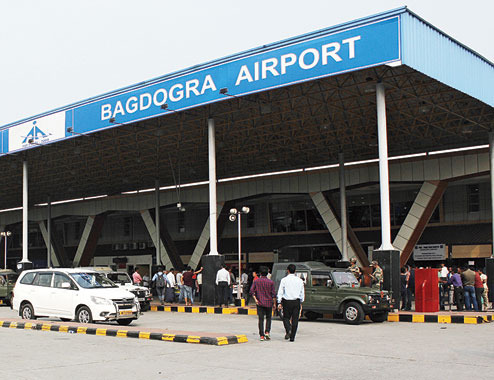 Bagdogra is well-connected through air route to all major cities in India. Book cheap flights to and from Bagdogra airport at lowest airfare.